This was an idea in progress. I wanted to blend the Nuvo Mousse in several colors for the background, and the focal image panel. It took me a few times to get it to look the way I had it envisioned in my mind. Does that ever happen to you? I used A Colorful Life Medallion Fade Stencil and several shades of Nuvo Mousse. There are so many wonderful shades of this mousse and it is so easy to work with. You can watch Pat Huntoon's video on this wonderful product here. I stamped Technique Junkies The Greatest Story on a panel with black pigment ink and colored it with detail black embossing powder for the best coverage, and heat set it. Then I used the same stencil and the blue and purple Nuvo Mousse and only put the mousse on the outside edges. I tied a ribbon around the layer and then used my heat gun to melt the ribbon a bit to "antique" it. I spritzed the top of everything with Dazzle Shimmering Bliss Topper spray. What a wonderful shimmer this gives! And now the last sales pitch for November. You can use my special discount code TJ10Judy and get a 10% discount on everything you buy, specials, everything! I hope you have a wonderful day, and you have a chance to get inky! 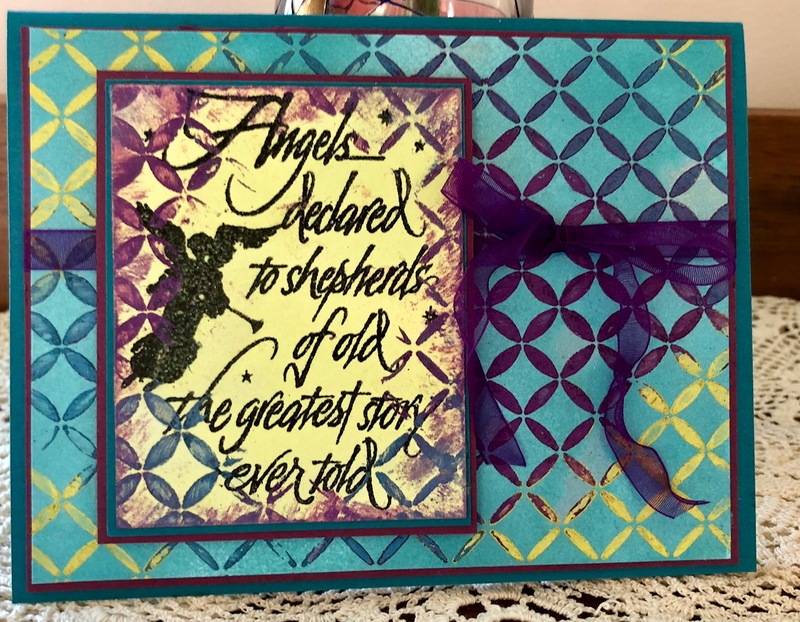 To create this card I used three Technique Junkies Stamps. I use Fir Forest, All Is Calm, and Star Stream. The stars and the trees were stamped with white pigment ink, anmd heat embossed with detail white embossing powder. The verse was first inked with Versamark, and then with dye based red ink on vellum. I then covered it with detail clear embossing powder and heat set it all. It was adhered with my Xyron machine. I added the cardinal brad. The white card stock is 4 1/4 by 5 1/2 inches. The red card stock is 4 inches by 10 3/4 inches and scored in half. I adhered it onto the white layer. The inside greeting in on a small piece of white card stock so it can be read easily. I then spritzed the top of the card with Dazzle Shimmering Bliss Topper. You can use TJ10Judy to get 10% off of EVERYTHING IN YOUR SHOPPING CART through the end of November!! This is a great gift from Pat Huntoon! So start shopping.There are only a few more days in November before this deal goes away! I hope your Thanksgiving is very special! And just perhaps you will have a chance to get inky! 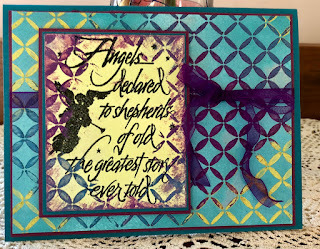 I used the Arrowhead Chevron Stencil with Vivid Volt Shimmering Bliss spray to create the background. 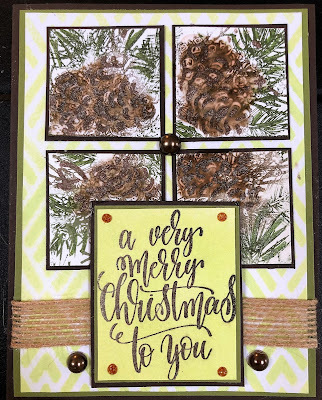 The Technique Junkies Stamps I used are Pine Spray and A Very Merry Christmas. I used markers on the Pine Spray and then added highlights with markers. You can use TJ10Judy to get 10% off of EVERYTHING IN YOUR SHOPPING CART through the end of November!! This is a great gift from Pat Huntoon! So start shopping. Have a great stamping day, and get inky! 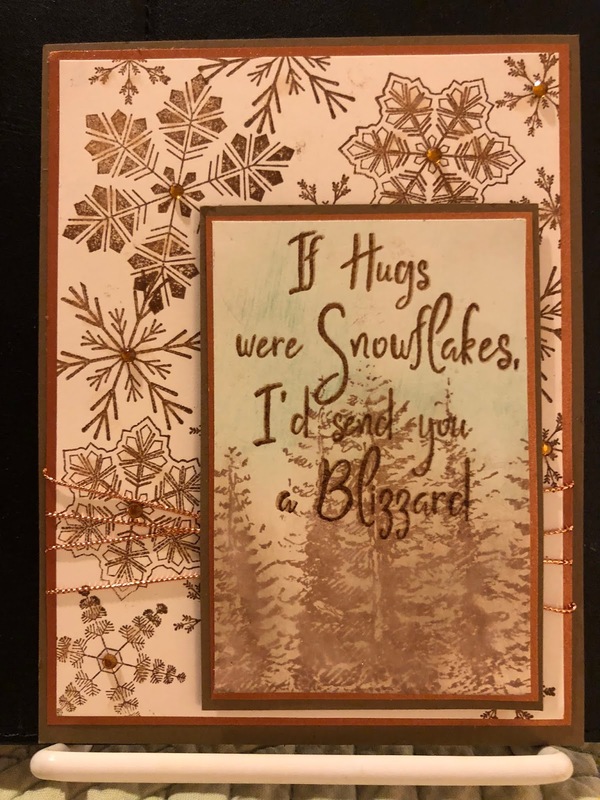 I used the Triple Play technique with this new TJ release set of Snowflakes with two colors of inks. The verse Merry Christmas is stamped with black Versafine ink and heat embossed with detail black embossing powder. The bottom layer of is framed with red card stock. The other two layers are framed with red glitter paper. 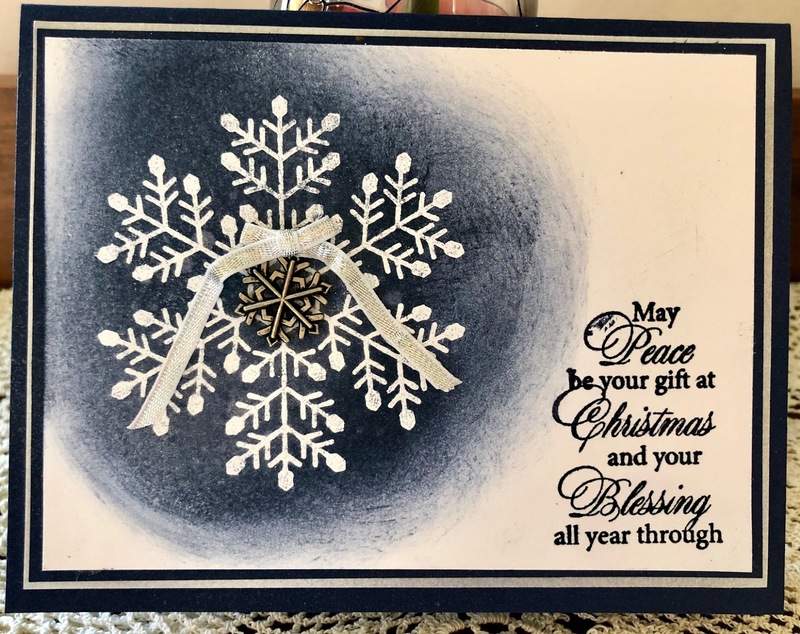 A few black rhinestones on the center of the snowflakes embellish the card. The base card is a creamy tan -- the same as the creamy tan ink for some of the snow flakes. 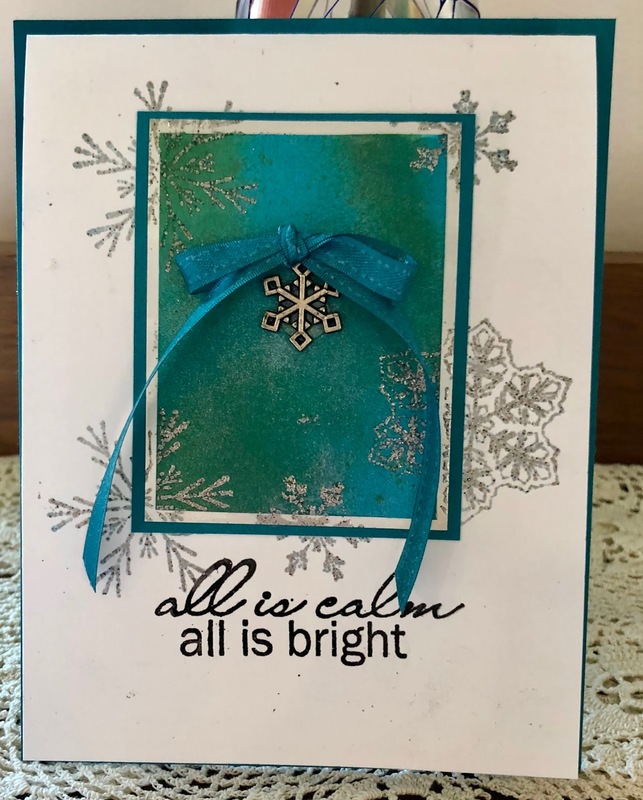 A gentle mist of Dazzle Shimmering Bliss Topper spray finishes the card and is heat set. Have a tremendous day, and get inky!! I had this die cut panel left over from another card project that I had made. Like most of the stampers I know, I try not to throw away perfectly good car stock unless it is too small to be used. So I sprayed this panel with green and dark blue Shimmering Bliss sprays. I heat set it to dry. Then it was stamped with snowflakes from the Technique Junkies November Release Snowflakes. I used white pigment ink and detail white embossing powder. Detail or extra fine embossing powder is a must when you are stamping an image or words so the details will still be clearly visible. Embossing powder spreads as it melts. I also sprayed this panel with Dazzle Shimmering Bliss Topper spray. It was adhered to the white card stock. I had previously punched a lace border. I cut a strip of navy blue card stock to adhere under it so the lacy details are more clearly visible. It goes all the way top and the entire panel is layered on a A2 size white card base. The words are from Technique Junkies Gifts of Christmas stamp set. I inked the words with Versamark and then with navy blue ink. 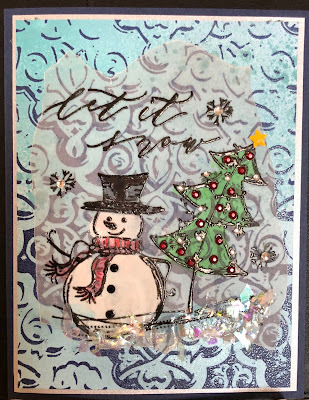 Then I used clear detail embossing powder and heat set. Make this day a good, and get inky! 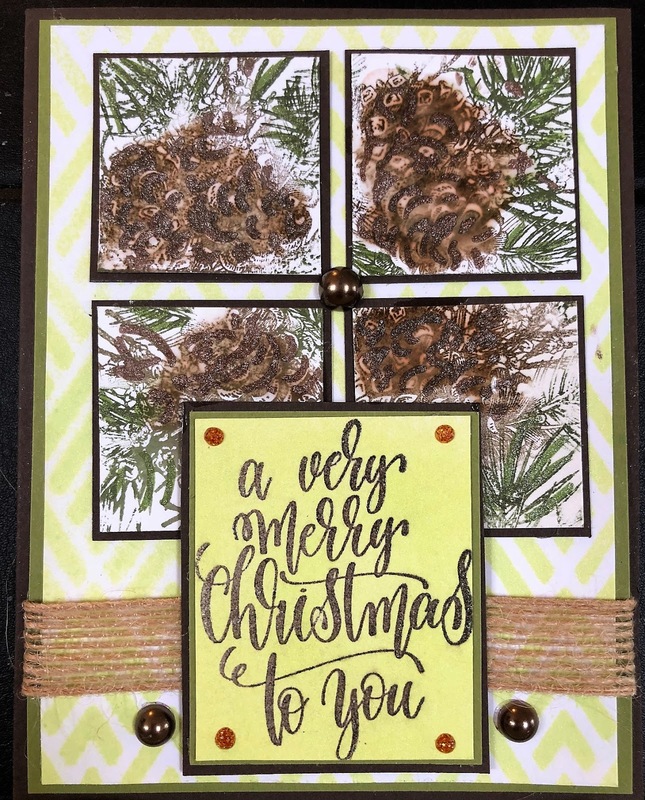 I used two Technique Junkies stamps to create this card. I used Fir Forest and Merry Christmas 2 which were stamped on a panel and placed behind die cut window. The sky was sponged on it first. 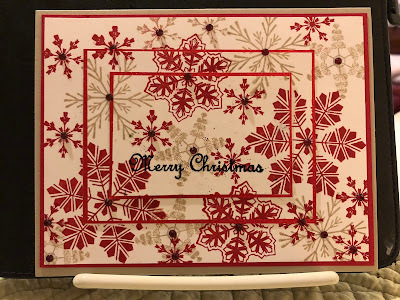 The top layer is a panel dry embossed with a snowflake embossing folder. White pearls were added to the center of some of the snowflakes. Dazzle Simmering Bliss spray was added to the top layer. The words Merry Christmas were stamped with black Versafine ink and heat embossed with detail black embossing powder. The bottom of this card is an A2 sized dark moss green piece of card stock. The main part of the card is 4 inches by 11 1/4 inches. It is scored in half and then after the card is ready to mount, it is adhered to the green card stock. The inside greeting is stamped on the inside of the folded white card stock. 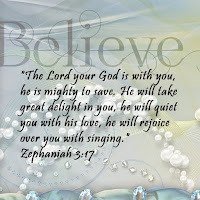 Have a wonderful day!! And get inky!! Even at Christmas time we all can use a hug! So this verse is just fine for Christmas as well. The Technique Junkies Stamps I used for this card are Fir Forest and Snowflakes. 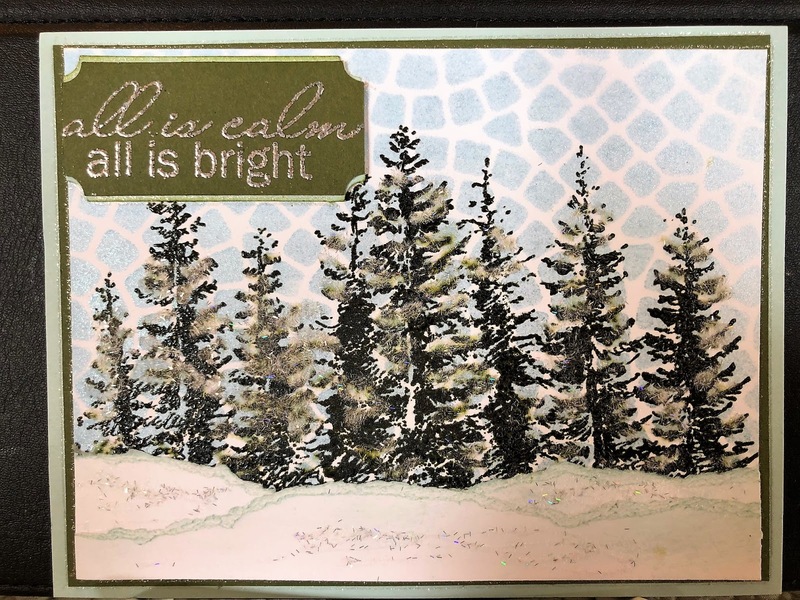 I used Dazzle Shimmering Bliss topper over the smaller panel with the trees to add a bit of delightful shimmer. Dark brown and copper card stock were used as layers for this card. Have a wonderful day! And get inky! 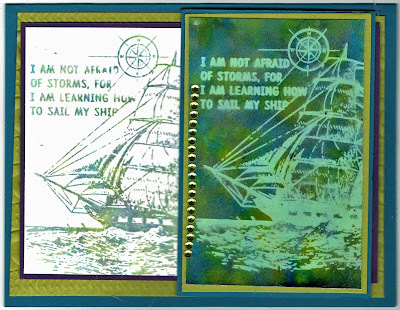 This Alcohol Lift card was created with Technique Junkies stamp Learning to Sail. The lift portion is on the right and the stamped off version from the lift off is on the left. This technique creates a cool card. It works best when the image has strong defined lines or is a silhouette. 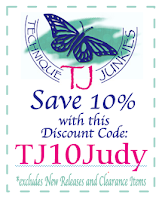 Save 10% off your total order by using the code TJ10Judy in the coupon box as you check out. A great way to save some money. Have a great stamping day and get inky! Merry Christmas - Day 30 of the 30 Days of Christmas!! 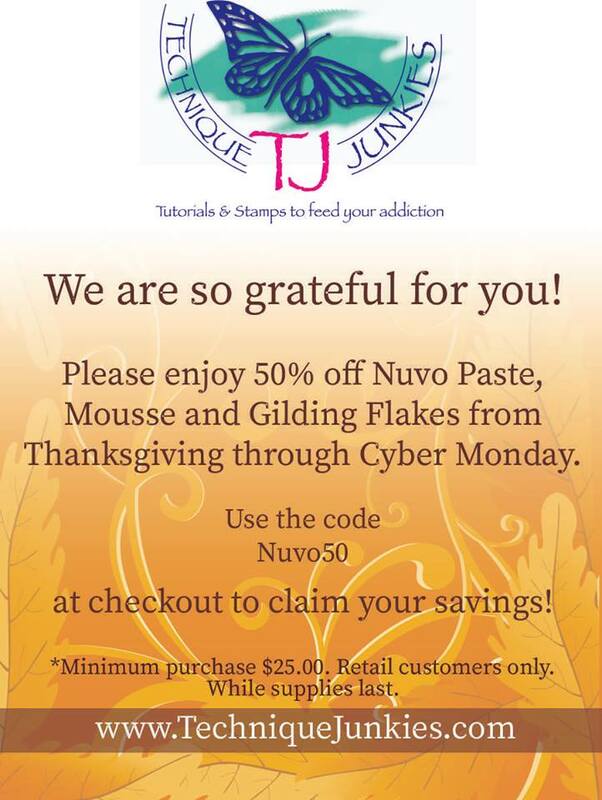 It is the wonderful season of the 30 Days of Christmas for Technique Junkies from October 15 to November 13. There is a 20% discount on all Christmas Stamps on the Technique Junkies web store! And this is the LAST DAY to get that 20% discount off of Christmas stamps. And to combine my TJ10Judy discount code with it. That saves you 30%!!! Don't miss this opportunity to save some money. I used stamps from three different sets from Technique Junkies Stamps. The vintage town is Night City Panel, Snowflakes, and Gifts of Christmas. The snowflakes were randomly stamped leaving space at the bottom for the verse. The Night City Panel was stamped first on a white panel and then die cut with a circle die. The die cut circle was lightly spritzed with Dazzle Shimmering Bliss Topper spray and quickly heat set so the ink would not run. Have an absolutely marvelous day!! And be sure to get inky! It is the wonderful season of the 30 Days of Christmas for Technique Junkies from October 15 to November 13. There is a 20% discount on all Christmas Stamps on the Technique Junkies web store! All stamps are from Technique Junkies. You do not need a code as it will come off automatically at check out. 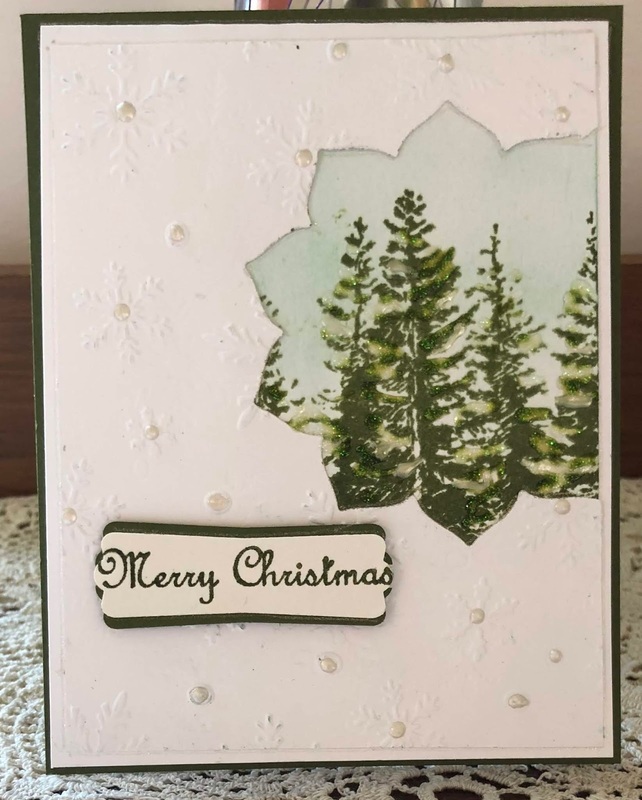 I used a Christmas embossing folder for the dark green card stock and spritzed it with Dazzle Shimmering Bliss Topper spray. 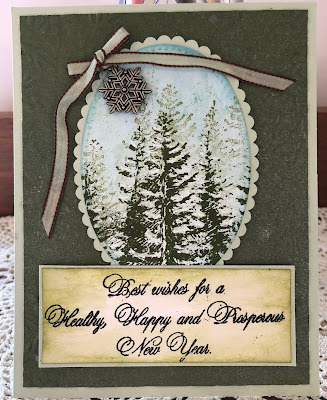 I used Fir Forest for the focal image and die cut an oval. The sky is sponged. 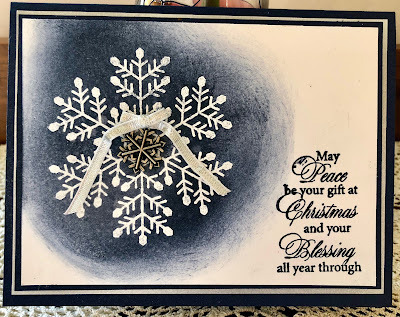 The greeting at the bottom is from Gifts of Christmas which was heat embossed with detail black embossing powder. Have a marvelous day! And get inky! It is the wonderful season of the 30 Days of Christmas for Technique Junkies from October 15 to November 13. There is a 20% discount on all Christmas Stamps on the Technique Junkies web store! 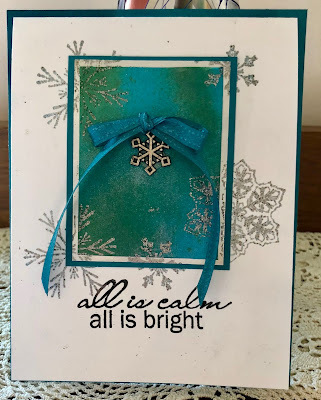 I used a snowflake embossing folder and Nuvo glitter drops for the center of several snowflakes. I used three Technique Junkies Stamps. I used Fir Forest, All is Calm, and one bird from Fly. I stamped the tree line, and die cut the circle. I punched out a circle of post it note paper and placed it where it would cover part of the the tree line.Then I sponged in the navy sky. I removed the moon mask, and chose one bird and a navy marker to ink only that bird and stamped it on the moon. I used a white get pen to add highlights of snow on the branches. I added ribbon on background and assembled the card. November Release stamps CAN also be used WITH my own discount code and, you can use TJ10Judy to get 10% off of EVERYTHING IN YOUR SHOPPING CART, including the Christmas stamps! This is a great gift from Pat Huntoon! So start shopping. Have a tremendous inky day. The beautiful background is a November Technique Junkies Release called Carved Relief. I stamped it a dark blue Versafine ink, covered it with clear embossing powder and heat embossed it. Then I sprayed Ocean Depth Shimmering Bliss spray over the panel. I stamped Technique Junkies Let It Snow on vellum. I colored from behind with Copic markers. 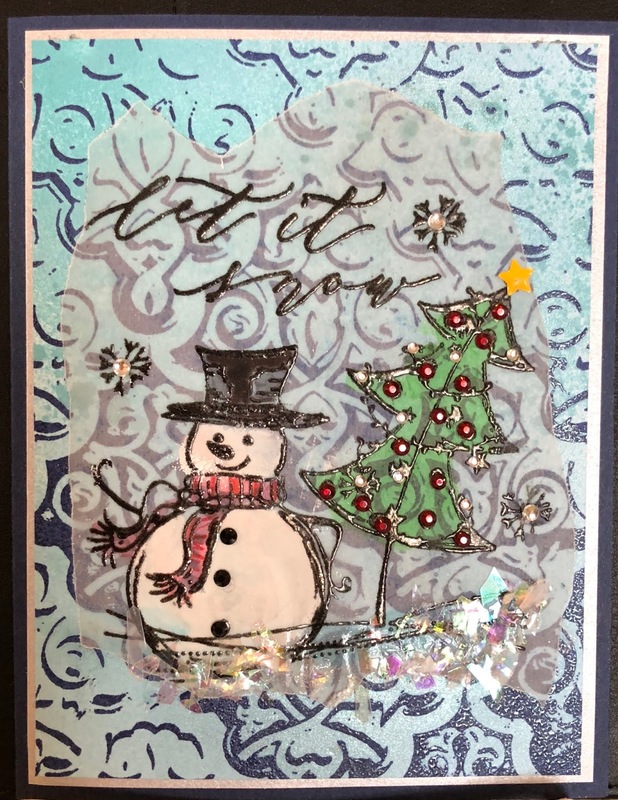 I did use a Versamark pen behind the snowman, and then covered it with white embossing powder and heat set. I used my Xyron machine to add adhesive. After adhering it the Carved Relief panel, I added Nuvo drops and small rhinestones, pearls, and faux snow as embellishments. AND don't forget you only have through the 8th to get an automatic 15% off of all of the November release stamps! 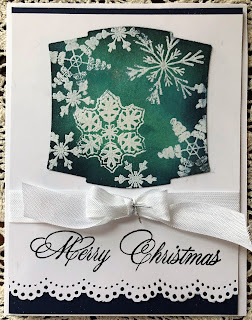 I inked and stamped the large snowflake from Technique Junkies Snowflakes with white pigment ink. Then it was heat embossed with white embossing powder. I burnished the circle around the snowflake with navy blue dye based ink. 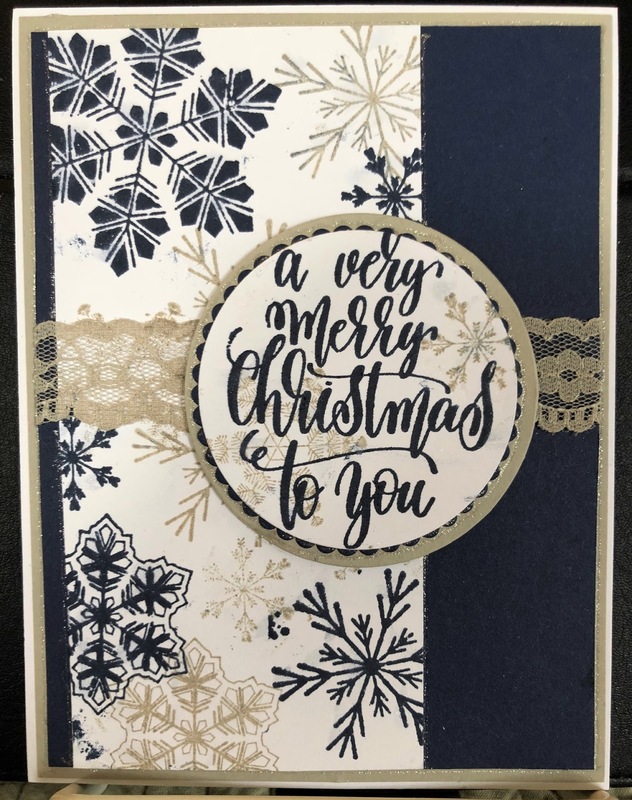 The greeting from Technique Junkies Gifts of Christmas was first inked with Versamark ink, and then inked with the navy blue ink before stamping on the card stock. I covered it with clear embossing powder and heat set. Everything was spritzed with Dazzle Shimmering Bliss Topper. What a wonderful shimmer! Remember all of the November Release stamps are on sale for 15% off through November 8. Have a tremendous day and get inky!! It is the wonderful season of the 30 Days of Christmas for Technique Junkies from October 15 to November 13. There is a 20% discount on all Christmas Stamps on the Technique Junkies web store! And all of the November Release stamps can be found here. I sprayed Technique Junkies Shimmering Bliss sprays (Dolphin Cove and Luscious Lawn) on a precut small panel. I let it dry completely, and then layered it on white card stock, and then again on metallic text weight paper. 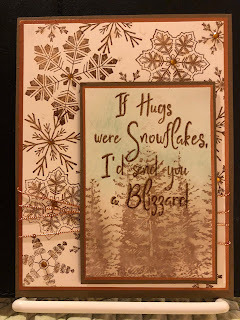 I stamped several snowflakes from Technique Junkies Snowflakes from the November release in a random fashion. They were stamped in Versamark ink and heat embossed with silver embossing powder. The greeting is Technique Junkies All is Calm stamp. Save some money by buying the November release stamps at 15% off through November 8! Have a spectacular day! And get inky!! Happy TJ Release Day and Happy 18th Day of Christmas! The first of a new month! As usual the Technique Junkies Design Team is excited about the new release. This is the last release of Technique Junkies stamps for 2018. Look for wonderful stamps in 2019. 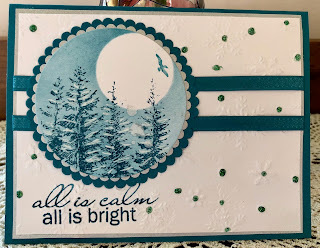 But for today we are focusing on THIS wonderful Technique Junkies Stamps Release Celebration for November 2018! These are wonderful stamps! You can find all of the November Release stamps here. Please sure you start your looking here Technique Junkies Blog. We are not having a blog hop today -- however every member of the Technique Junkies Design Team does have a special blog post today. And the entire list list of Design Team blogs can be found here. And of course all of my cards today feature only stamps from Technique Junkies Stamps. My first card uses All is Calm and Fir Forest. 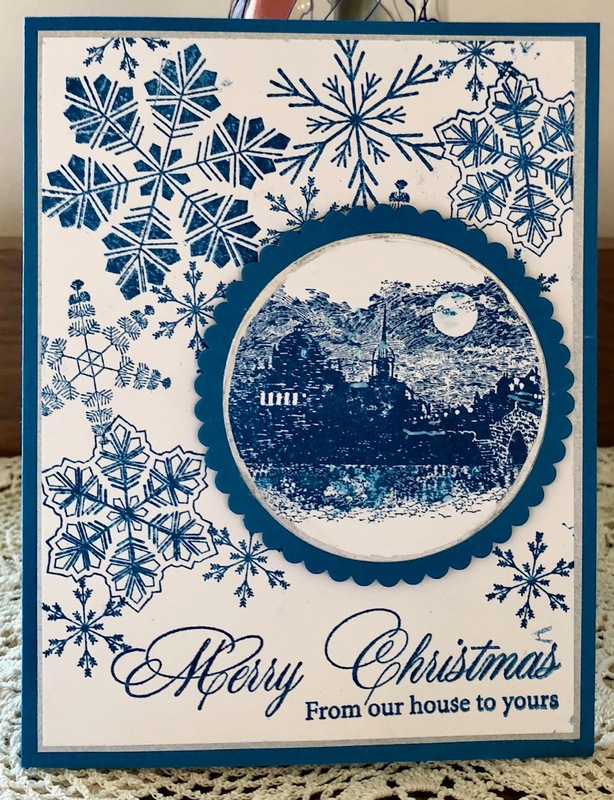 I also used Circle Mosaic Stencil from A Colorful Life Stencils. to create the sky. I used Ocean Depth Shimmering Bliss sprayed over the stencil. Torn white card stock created the snow banks edged with a bit of "fake snow" over glue at the edges. 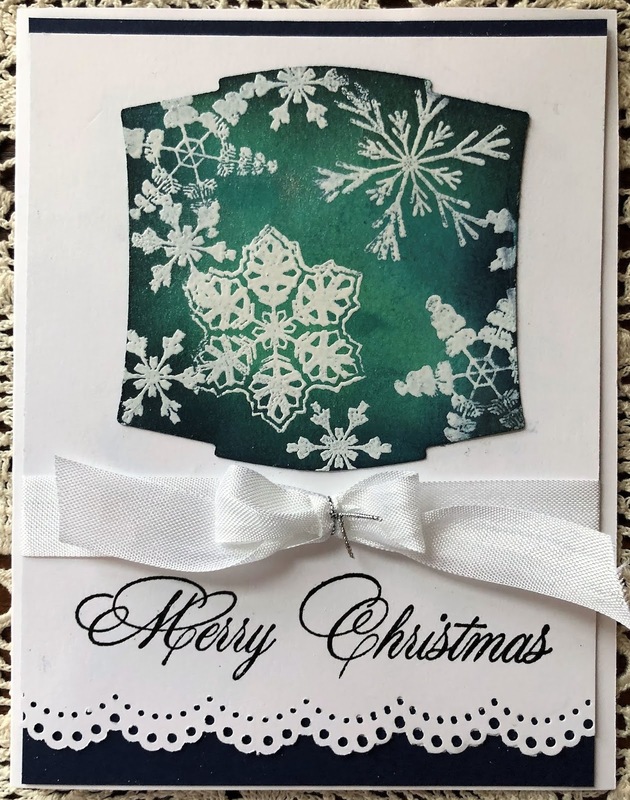 My second card uses the newly released Snowflakes stamped in two colors of a narrow panel of white card stock. Punched circles frame the greeting stamped with navy blue ink. The greeting stamp is A Very Merry Christmas. Dazzle Shimmering Bliss topper is misted over the snowflakes gives a delightful shimmer. 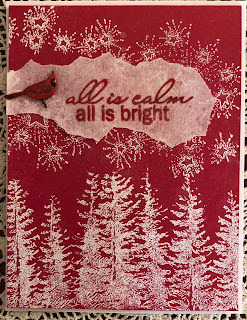 My last card used a new release that is not necessarily a "Christmas" stamp but I used it that way. It is called Music Opens the Soul. The other stamps on the card are O Holy Night and Star Stream. 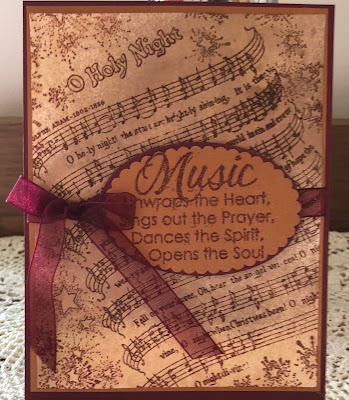 The stamp Music Opens the Soul is stamped on copper text weight paper. All stamps were heat embossed with maroon embossing powder. I sprayed that card stock with Harvest Sunset Shimmering Bliss. 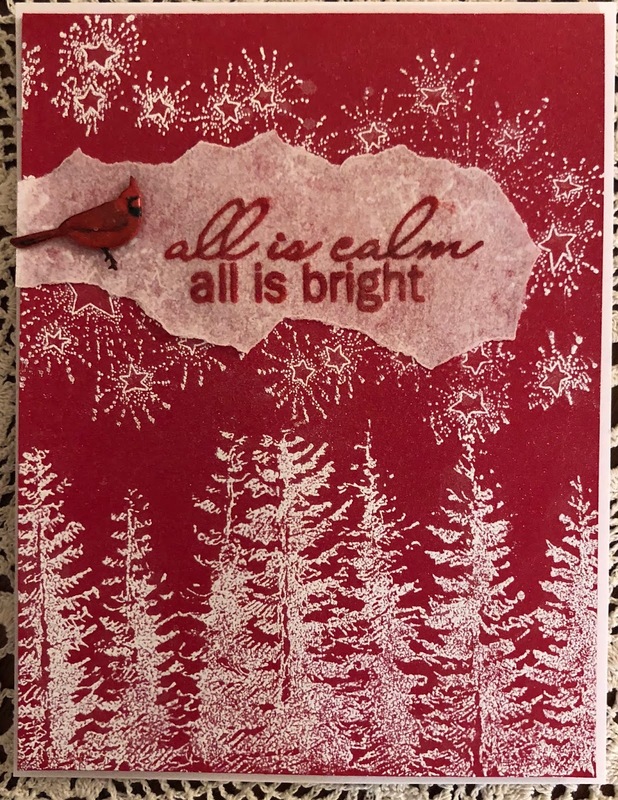 Even though this is not a Blog Hop day, it is also the wonderful season of the 30 Days of Christmas for Technique Junkies from October 15 to November 13. There is a 20% discount on all Christmas Stamps on the Technique Junkies web store! ALL of your order CAN also be used WITH my own discount code and, you can use TJ10Judy to get 10% off of EVERYTHING IN YOUR SHOPPING CART, including the Christmas stamps! That gets you a 30% discount off of the Christmas stamps! And a 25% off of all the November release stamps. This is a great gift from Pat Huntoon! So start shopping to get this huge savings!